Join with us on this unique floating safari in the wondrous Selous Game Reserve! 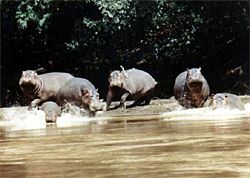 The float down the Rufiji River is a superb introduction to Tanzania's legendary Selous Game Reserve, the largest and wildest reserve in Africa. 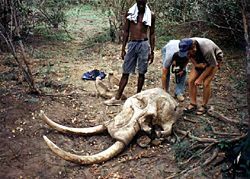 With an area of over 18,000 square miles, the Selous is home for vast numbers of wildlife including the continent's largest elephant population. But this is no place of zebra striped minibuses and lodges with gaudy gift shops; the Selous has only a sparse and virtually unused network of tracks, and tourism development is confined to its margins. This is Africa almost as Livingstone saw it. As we float down the Rufiji and follow game trails in the bush it becomes clear that apart from a rare Wildlife Department patrol, no one has passed this way in years. The trip begins with a ride on the Chinese built Tazara railway. Cutting through the northern part of the Selous, a park like paradise of grassland with scattered trees and thickets, we are treated to perhaps the world's best wildlife viewing from a train. At Fuga Halt, 4WD vehicles meet us for a short drive to a shady campsite at the foot of Hatambula Hill. 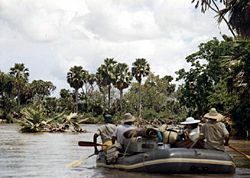 The next day we drive on bush tracks to the put in near the confluence of the Great Ruaha and Rufiji, where we rig the boats and paddle downstream, aided by a good current coursing between rocky banks. After Mkalinzu Rapid (no problem), the river widens and the hills near Sliegler's Gorge loom ahead. This is a fine area for bush walks, with good chance to see elephants, lions and some exciting birds. The next day, our well drilled and coordinated paddling skills meet the challenge of Stiegler's Gorge, with wild rides and great photo opportunities at Pangani Rapid, Con Man's Foil and the Ropeway Rapid. After the sheer 100 meter walls of the Gorge drop away, we enter one of the best wildlife areas, and layover at one superb campsite that offers an exceptional variety of walks, and a great view of the sunset. From here, we round a corner and soon enter the labyrinth of channels, swamps, and lakes that the Rufiji created when it left its original bed in 1973. This area is especially rich in birds: fish eagles, herons, Egyptian geese, myriad of storks, bee eaters, kingfishers....We frequently surprise buffaloes and elephants on the banks, while we vie with the hippos for right-of-way. This is a fantastic area of tall borassus palms rising out of the waters, some drowned, a phantom forest, some still flourishing, making a superb tableau with a glowing sunset behind them. Our final destination, after passing Lakes Manze, Nzerakera, Mzizima, and Siwando, is the tented Rufiji River Camp, where cold Safari Lager, excellent food, and a friendly staff await us in an ambiance of comfort and informality. We return to Dar-es-Salaam by light aircraft or 4WD vehicle, completing a unique and intimate foray into the African bush. Within a short distance of Dar-es-Salaam there are a variety of superb skin and SCUBA diving options for beginners and experienced divers alike. After the Rufiji River rafting safari we highly recommend a few extra nights stay at the Rufiji River Camp. This a truly wonderful bush camp with fantastic wildlife viewing and no other tourists. Additional cost. 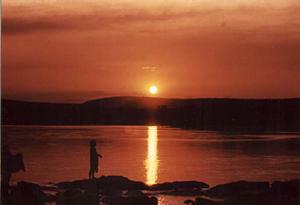 A great place to fish for the giant Rufiji catfish, take a motor boat ride, or just relax. The spice rich tropical island blending all the cultures of the Indian Ocean. Stanley and Livingstone roamed the narrow streets of its old Arab town before starting their historic journeys. The island is a scenic gem, dotted with old Arab ruins and fragrant plantations of cinnamon and clove. Its unspoiled beaches and coral reefs guarantee a relaxing finish to a great adventure safari. We're happy to assist with arrangements for climbing Mt. Kilimanjaro, safaris in the Serengeti National Park, and other superb options in Tanzania.